Just a quick note – Think Pink Sundays is going to take a week off next weekend for Christmas!! We will resume the next week – if you’re not out partying for New Years, come link up! Time to Party!! Welcome to Think Pink Sundays!!! If you need a last minute gift idea our most clicked link would be so fun! It’s this DIY Ruffle Scarf by Cheryl at That’s What Che Said! 3. I’d love it if you would follow along! You’ll want to check back and see if you’ve been featured!! 4. Visit!!! Be Inspired! Share some comment love! Thanks for hosting Bev and Merry Christmas! I am tickled Flamingo Pink! I am so flattered that my little ruffle scarf had the most clicks! Thanks for hosting Bev! Have a great rest of the weekend! Thank you so much for hosting Bev!!! Thanks for hosting! Good for you taking off next Sunday….my blog is taking Saturday and Sunday off. :-) Merry Christmas! Beverly, thank you for hosting! Hi Bev! Thanks for hosting. Hope you’re having a wonderful holiday season. Merry Christmas! Your party is rockin! I am linking up my pennant ornament! 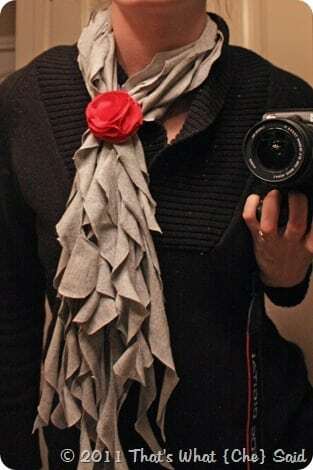 I love that ruffle scarf!